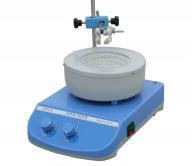 Product Name : Temperature Adjustable Magnetic Stirring Heating Mantle Model : TWCL-T 50ML- 10000ML HS : 8543709990 Feature : 1.9 series mantles sizes available from 50 ml to 10000ml ! 2.Built-in electronic controller ! Designed for stirring and heating of liquid . Built-in temperature control maintains element temperature from ambient to 400°C ! Stirring is Independently controlled with a variable speed control up to 2000rpm 3. Stirring and Heat Knob for both Temperature Reduce and Add and stirring speed : Providing repeatable and accurate results every time as your request You can set temperature and stirring speed as you want ( Temperature:Ambient to 400°C. Stirring speed : 0 - 2000rpm ) ,It can stop working automatically when setting temperature or stirring speed has achieved. Temperature Control Accuracy ± 3°C, 5.Removed support rod holder: Rear housing features an off centered, removed support rod holder with locking knob that accepts the optional Support Rod and Clamp Kit. 6. Two Switches controlled stirring and heating function respectively : They can work well by oneself ,or both ,at the same ttime .There is no influence between stirring function and heat function . 7.Ramping feature: Slowly increases speed for improved safety and enhanced coupling. Avoids splashing, improves spin bar control and provides excellent low end speed control. Applications : General lab heating and mixing . Place an Order 1.There is low mininum quantity requirement for buyers MQQ one set . 2.We can customize as your requests . Your designs will be protected by our company to ensure that no unauthorized person has access to your designs. 3.Pls contact us and let us know the item number which you like after visit our website, so that we can offer you the most reasonable prices soon within 24hours by email Payment Terms 1.1.T/T or Westen union ,paypal, are accepted. 2. Deposit should be received before production, and balance to be paid prior to delivery. Shipping: 1.Delivery is depends on the quantity of order, normally, 7 days or so after receiving the deposit 2.Shipment cost will depend on the destination, shipment way and the weight of the goods by Express like FEDEX,DHL,UPS,TNT etc. or any given shiping agency 3.Shipment advice will be sent to you after shipment arranged within 24 hours. Port: shanghai Packaging Details: The goods pack in a Styrofoam and corrugated paper box to avoid damage in transit. External package : neutral carton. Supply Ability: 1000 set/ sets per Month We have prompt delivery and considerate service after sale. Our business goals: reasonable price , excellent quality, exquisite workmanship, prompt delivery, satisfying service! Contact us: We are really appreciating if you offer us suggestions or reviews on our products and services. Our company is specialized exporter, manufacturer and supplier of Temperature Adjustable Magnetic Stirring Heating Mantle in China.